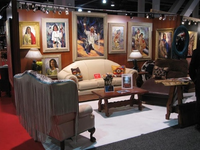 Northwest Native Designs makes custom designed leather furniture in Western and Native American motifs, hand made with exceptional quality and craftsmanship. We make the softest, most comfortable leather furniture you can buy. All frames are made to order out of alder and guaranteed for life; upholstered in leather or fabric or a combination of your choice. Our unique concept gets attention, but the feel of our furniture is what sets us apart. Our designs are exclusively ours, and we work with you from start to finish to create a piece that is one of a kind - and uniquely yours. Each of the following previews links to an album of related products. You can also start your tour via the Gallery link. Items with prices are available for replication as shown and online purchase. Many items without prices can be also be customized with your choices of color, materials, features and artwork; pricing and delivery time to be determined by the details of the order. In addition to our furniture lines, we are pleased to present the work of other artists and artisans, whose ideas expressed in paint, carving, and precious artifacts can enhance our own work and add beauty to your environment. Please read the terms of sale on the order form before ordering. See How to Buy for more information. Cowboy Christmas: A Great Show! Recently we have appeared at the Calgary Stampede, Cowboy Christmas in Las Vegas and the San Antonio Rodeo. We'll be doing more shows as we expand our horizons to the whole country. We always bring a sampling of our various styles, colors and artwork. Visit The Gallery for more examples. All images and designs, unless specifically attributed to another, are copyright Northwest Native Designs and/or Ernie Apodaca.